A DNA test on the "Boy with the Amber necklace" would be interesting. The links between the Stonehenge area and the Mediterranean have been debated for years. Recent research by the British Geological Survey (BGS) suggests people came from both the snow of the Alps and the heat of the Mediterranean to visit Stonehenge. However, scientific studies show that some of the people buried in the area during the Bronze Age were not local. The analysis of the teeth from two males provides new evidence that one, dubbed ‘the Boy with the Amber necklace’, had come from the Mediterranean area, whilst the previously known ‘Amesbury Archer’ had come from the Alps. ‘The Boy with the Amber necklace’, whose grave was found on Boscombe Down, about 3 km south-east of Stonehenge, is from a more recent time — the end of the Early Bronze Age. 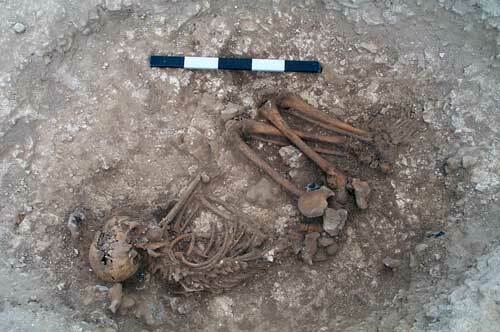 His skeleton has been radiocarbon dated to around 1550 BC (dated by Wessex Archaeology). Aged 14–15 years when he died, he was buried wearing a necklace of around 90 amber beads. "Most Holy Father and Lord, we know and from the chronicles and books of the ancients we find that among other famous nations our own, the Scots, has been graced with widespread renown. They journeyed from Greater Scythia by way of the Tyrrhenian Sea and the Pillars of Hercules, and dwelt for a long course of time in Spain among the most savage tribes, but nowhere could they be subdued by any race, however barbarous. Thence they came, twelve hundred years after the people of Israel crossed the Red Sea, to their home in the west where they still live today." An Iberian origin would support the notion that meaglithic culture was a pan-Atlantic coast culture, something that there is already significant evidence to support through the Bronze Age. An origin from further West, say Greece or Lebanon would, in contrast, be really quite exceptional. The Declaration goes on to say that the Scots defeated the Picts (the Pictish throne became a Scottish one in the 800s CE). The date "twelve hundred years after the people of Israel crossed the Red Sea," in the Declaration is probably derived from "The History of Nennius" written ca. 700 CE, which states that "a thousand and two years after the Egyptians were lost in the Red Sea, they passed into Ireland." According to the leading efforts to date historical events that would have happened around the time that Jews appeared in the Southern Levant from Egypt (ca. 1200 BCE), the first date would be ca. 0 CE, the second ca. 20O BCE, which wouuld be around the time that the Gauls migrated from Britain from what is now France and around the time the trade with the Roman empire picked up. Some people looking at the questions look to a date 300 years earlier (around the time the the Semitic Hyskos invaders were expelled from Egypt) or 400 years earlier (around the time of the eruption of Thera, one of the possible sources of the Atlantis myth as well). The leading view among scholars is that Celtic language speaking Indo-Europeans arrived in the British Isles from Celtic Europe sometime ca. 1200 BCE, around the same time that cremation starts to appear in the archeological record, and became predominant culturally by 500 BCE. The place that The History of Nennius specifically identifies with Scotish origins is a town known in the Roman era by the name of Brigantia near Coruna in the province of Gallicia in north-west Spain. The Boy with the Amber necklace would have been buried a few hundred years before disruption of British society associated with the arrival of the Celts in the early British Bronze age which is usually thought to commence with the appearance of Beaker culture artifacts around 2300 BCE, and shows continuity with the culture that began the British Neolithic area starting around 4400 BCE. Thus, the boy would also predate the presence of Celts in Iberia, by either the archeological account or the Scotish national myth (which has close parallels in Ireland). (1200 bc) do you think that the genetic input of the Indo-Europeans that entered Britain (who themselves were probably very mixed with pre indo-european folks of continental Europe) would be small? Thanks for your comments. Much appreciated. I put the reference up simply to point out that the Scots themselves believed that they were from "Greater Scythia." I wouldn't put much stock in the dates. "The leading view among scholars is that Celtic language speaking Indo-Europeans arrived in the British Isles from Celtic Europe sometime ca. 1200 BCE, around the same time that cremation starts to appear in the archeological record, and became predominant culturally by 500 BCE." Yes. But as the Boy-with-the-Amber-Necklace and Amesbury Archer finds indicate, there was travel between Europe and the British Isles for many centuries, and probably millenia, before the arrival of Iron Age Celts. The archaeological record suggests a Bronze Age migration to both Scotland and Ireland. That's not to say that there weren't even earlier peoples in the British Isles. "The Declaration goes on to say that the Scots defeated the Picts (the Pictish throne became a Scottish one in the 800s CE)." The Declaration of Arbroath is incorrect in stating that the Picts "were utterly destroyed." That statement is a nice piece of political handywork, meant for the Pope. In fact, the Pictish King Constantine was raised in Ireland by his aunt, who had married a Gaelic King. Constantine unified the Picts and the Gaelic Scots under a new kingdom, Scotland. The Boy-with-the-amber-necklace is interesting in that it suggests that there was travel from afar to Britain before the Iron age. I don't have a good handle on the relatively population genetic contribution of Indo-Europeans to Neolithic Europe or to Neolithic Britain. It is possible that the Indo-Europeans were an offshoot of the Neolithic European population that grew distinct and then surged back onto the historical scene. If so, two populations separated by just a few thousand years of population genetic divergence and founder effects would be very hard to distinguish in the data, because you would be looking at populations with different proportions of the same haplotypes, rather than two populations with distinct haplotypes. I do think that the genetic contribution of pre-Neolithic populations to the Neolithic gene pool was quite low and that most of that contribution would have come from late post-LGM repopulations of Europe from refugia that were very different from a population genetic make up modern humans in the Upper Paleolithic around the time of contact with Neanderthals and that the reason that we don't see a population genetic cline of Neaderthal contribution ot the genome of Eurasians is because the non-Near Eastern Europeans with large fractions of Neanderthal ancestry were wiped out or diluted beyond recognition in some combination of the LGM retreat and migration into Europe by Neolithic farmers. And, the Greater Sythian origins would certainly square with the modern sense of where Indo-Europeans came from, and they would have been closer to the source than we are. Indeed, the Scotish national myth almost sounds like a graft of a historically based Bronze Age collapse myth that didn't actually involve proto-Celts, onto a separate Celtic migration to the British Isles myth that also had a historical basis. It seems likely from the archeological record that there was travel to Britain from afar dating at least back to the Neolithic. The crops and domesticated species are proof of that, as are trade goods and cultural links. Whether there was cultural continuity from the Neolithic all the way to the arrival of the Indo-Europeans, or whether there are two or three layers in that part of European pre-history is in my mind a harder question. Indo-European input amongst French is about 10-15% and the figures of the Britain should be lower. Note that "the light green indo-european component" is present amongst south Indians and that's in line with indo-european incursions to southern India. Light blue component is too old and not so widespread to be bronze age indo-european. Also light blue as well as pink and purple is not so widespread to be indo-european. The complex internal synthethic structure of the proto indo-european language as well as proto indo-european words for metals, complex mythology, agriculture, animal husbandry, horse mastering and chariot&war abilities suggest that the biocultural genesis of proto indo-europeans took place in one of the complex chalcolithic cultures of the ancient near east (hassuna-halaf cultures) this is also sustained by phenotypical proofs of excavation of kurgans as well as ancient depictions and current racial inventory in such indo-european strongholds as Anatolia, Iran, India, Greece (please read "indo-europeans and indo-european languages" of gamkrelidze&ivanonv ) and could not be the product of paleolithic or early neolithic cultures of-out of ice age-Europe. Ashraf, are the component percentages of Turks you wrote in that link the real percentages taken from the actual writings of Behar et al., or did you infer them all by yourself by looking at the distribution of the components in that ADMIXTURE analysis graphic of Behar et al? If the first one is true, could give link to your source if it is accessible on the net? If the second one is true, could you tell how you inferred them? Thanks in advance. Those percentages are in fact mere personal by-eye estimations (I cheated a little bit to make their sum=100). Though the religion and pantheon of proto indo-europeans was rather different and shared similarities as well as common myths with Egyptian, Kartvelian, Sumerian and Semitic ones. Just as I expected, as there are no percentages in the Behar et al. paper. It seems we can learn the real percentages only through consultation with someone from the Behar et al. team or someone who has already consulted. Maybe Polako has.